Did you know that scientific evidence supports biblical creation, yet evolutionists fight and suppress the true facts? Or that scientists who believe in a young earth or worldwide flood, as described in the Bible for example, are often prevented from publishing their work in scientific journals? And what about the fascinating field of Epigenetics, which is the key to the vast genetic variety in a species? Evolutionists once claimed that these changes were proof of Darwin’s theories. Now we know many variations are caused by external influences on DNA that turn genes on or off. Dr. Jerry Bergman will present both of these intriguing topics at the next Creation Science Society of Milwaukee meeting, slated for 6:30 p.m. on Tuesday, March 8, 2016 at Grace Bible Church, 2643 South 117th Street, West Allis, WI. Sponsored by the Creation Science Society of Milwaukee, the presentation is free and open to the public. Creation Science Literature and DVDs will be available. Dr. Bergman teaches biology, chemistry, and anatomy at Northwest State College in Archbold, Ohio and is an adjunct Associate Professor at the University of Toledo Medical College. He has 9 degrees, including a Doctorate from Wayne State University in Detroit, Michigan. His over 1,000 publications are in both scholarly and popular science journals, and he has published 38 books and monographs on topics ranging from mental health and religious discrimination to vestigial organs, psychology and religious cults. He has also contributed to dozens of textbooks and has presented over 100 scientific papers in the U.S., Canada, and Europe. Dr. Bergman’s work has been translated into 12 languages including French, German, Italian, Spanish, Danish, Polish and Swedish. His books and, or books that include chapters he authored, are in over 1,400 libraries in 26 countries. He has spoken over 2,000 times to college, university, and church groups in American Canada, Europe and Africa. He has also been a guest on hundreds of radio and television shows. Is it possible to know if Nimrod really did build cities like the book of Genesis says? Or was King David a real person? Did the Queen of Sheba visit Solomon? Did Pharaoh Shishak attack Rehoboam? Did King Ahab really exist? Is there any proof for King Omri’s existence? Were kings like Jehu and Jehoash and Hoshea just made up? Did King Ahaz and King Hezekiah leave any artifacts from their reigns? How about this question, did an angel from God really wipe out an entire Assyrian army? And why did Belshazzar, ruler of Babylon, only offer to make Daniel the third-highest ruler of the kingdom? Throughout the Bible we read about events recorded as history. But is there any record outside of the Bible confirming Scripture’s account? The answer is a resounding, yes! Starting in Chicago, then on to London, Paris, Berlin, Jerusalem, and museums elsewhere, Randy Melchert will lead his audience on a global tour of secular museums and uncover the incredible archeological proof for the Bible’s historical accuracy. So fasten your seat-belts and get ready to discover this evidence! Take the armchair global tour with Randy Melchert at the Creation Science Society of Milwaukee’s February 9, 2016 meeting. The tour (presentation) begins at 7:15 pm at Grace Evangelical Lutheran Church, W196 N9525 Cross View Way, Menomonee Falls, WI 53051. Map The church is on County Line Road – Hwy Q, about 1 mile west of Hwy 41-45. Use the west church entrance. Next time you encounter skeptics who challenge the accuracy of the Bible, or well-meaning friends who say the Bible is a moral guide, but not historically accurate, take them with you on a virtual trip—or better yet, in-person--to see proof of the Bible’s accuracy. Randy Melchert is an attorney, past intercollegiate debate national champion, former radio station owner, and 2014 candidate for Wisconsin State Treasurer. Melchert has a Bachelor's degree in Bible from Bob Jones University, a Master’s degree in Church History from Trinity Evangelical Divinity School, a second Master’s degree in Rhetoric and Public Address from Bob Jones University, and a Juris Doctorate from the University of Wisconsin. 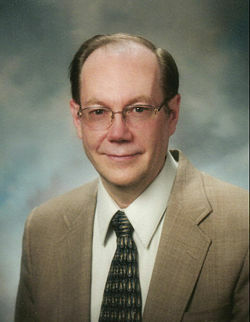 He currently serves on the CSSM Board. Melchert has also led several tours of the Oriental Institute--a secular museum at the University of Chicago--that contains the largest collection of Biblical artifacts in the Western Hemisphere. He developed a self-guided tour of the museum and other Christian interest sites in Chicago that he offers for free at http://bit.ly/chicagobiblehistory. This event is sponsored by CSSM. The program is free and open to the public. Creation literature and DVDs will be available. Tuesday, March 8, 2016, Dr. Jerry Bergman presents, "Science's War Against Christianity!"